So there are more rumors about the next update to Windows. You know the one that is getting called Windows 8.1, Windows 8.1 Update 1 or even Windows 8.1 Service Pack 1. Oh yeah and it is also the one that Microsoft will not even admit to working on. Well it seems that the latest one brings us back to the debate about the ModernUI and the start screen. As most of you know, Microsoft decided to take a wrong-way-round approach to giving people a common experience across all platforms. They took the UI concept from their struggling Windows Phone product and pushed it up into tablets, desktops, and even servers despite comments from Beta testers, and people that used the Consumer Previews that this was a bad idea. Microsoft pushed on and released Windows 8 with nothing but the start screen for all devices. Yes, there was a desktop, but to do anything you still had to go back to the start screen and navigate from there. There was (and still is) a combination of full screen apps and regular “desktop” apps that use the regular Window. For many this was simply cumbersome and they either opted to downgrade to Windows 7 or purchase 3rd party software to give them back the original start button (and menu). Some also purchased utilities that allow you to run ModerUI apps inside their own Windows. This means that you do not have to navigate to the start screen for anything unless you want to. So, what does my digression have to do with the next update to Windows 8.x? Well you see the rumors out and about are claiming that Microsoft will be adding in the option to completely by-pass the start screen by default. This means everyone will boot straight into the Windows desktop. Currently you can opt to boot to the desktop if you want, but it is not enabled by default. Still rumors persist that Microsoft will do a 180 and disable the Start Screen by default. As much as I would love to see them do this, I do not think it is likely. Booting to the desktop by default would push developers away from the app store and back to traditional Windows applications. This would be very bad for Microsoft in the long run as they are still (at least for now) trying to become a devices and services company. Making their product the same as before and removing the services and apps offered by the app store could actually hurt the product more than it would help. 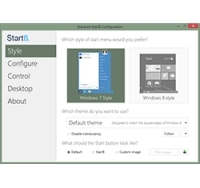 You also have the fact that Microsoft is very aware of the third party start menu market. They know that people looking to run Windows 8.x in the same way they did Windows 7 and Vista will simply buy one of these products and make it their own. There is no reason (at this time) to invest time and development effort into something as insignificant, to Microsoft, as removing the start screen. In all reality Microsoft has other things to worry about besides the desktop vs moderUI debate. From what I am hearing many of the updates will actually be about bringing more services to Windows 8.x a well as some needed security and compatibility fixes and the possible appearance of a newer and cleaner version of DX11. Any major UI or work flow changes they will probably save for Windows 9 unless Steve Ballmer’s replacement decides to make a quick return to the way Windows was before Microsoft started trying to be Apple.